Things have been pretty quiet around this blog for a while, and for once it isn’t my fault — it’s this guy’s. We had a baby last week. It still seems like a vaguely impossible, too-good-to-be-true thing. Every time I bend over his bassinet and discover that he’s really there, it’s a delightful surprise. His name is Beren, from the legends woven into The Lord of the Rings, and we think he’s pretty much the greatest. Ryan and I have fallen into Baby World, where time seems to zoom forward during the day and tick backward at night, where yoga pants are formal wear and a walk around the block requires as much preparation as a polar expedition, and our schedules are filled with items like “Take a shower” and “Eat a sandwich” and “Change the socks you’ve been wearing for three days,” and we end up skipping about half of them, because we’ve got better things to do. Anne Greenwood Brown, one of the wonderful writers in my critique group, says that babies are like campfires; you just sit and stare at them, hypnotized by every wriggle and flicker. She’s dead on. We can hardly stand to look away. So…that’s where most of my time, energy, and brain power has been going for the past several weeks. Luckily, Beren arrived between rounds of revision on the YA novel, and I’ve pared down my travel and appearance commitments for the remainder of the spring, so I can just nestle down inside the house with this tiny new person. So far, I’m loving this quiet time. Of course, things aren’t actually quiet. Friends and family drop in to shower us with food and gifts and stare at the campfire for a while. And then there are the noises Beren makes. Sometimes he sounds like a squeaky door hinge, and sometimes he sounds like a baby pterodactyl; sometimes he chirps like a bird, and sometimes he hums and smacks his lips like a greedy little gourmand. There will be more writing news here in the not-too-distant future. In the meantime, I’ll be here, in my wrinkly pajamas, staring at a baby. The most beautiful of all your creations, Jacqueline. That’s so sweet. Thank you so much, Auntie Jill. Aww, he’s adorable. I miss this stage, but it’s awesome when they can talk too. Love the quote about the campfire, so perfect. Thank you! We’re loving the teeny-tiny stage too, but I can hardly wait to hear his little voice (and to find out what he has to say). Oh my gosh!!!!!!!! *Squeeeeeeee* He’s SOOOOOOOOO cute!!!!! Congratulations!!!! My mom says, “I still can’t believe that they’re in you for 9 months and then BAM. They’re here.” And when I saw this blog post 2 minutes ago, I literally was like, “OMGOMGOMG!!!!! IT’S A BABY!!!!!!!!! AHHHHHHHHHHHHHH! SOOOOOO CUTEEEE!!!!!! !” and I seriously screamed. Thank goodness I’m home alone… so what does it feel like to be a mom? But seriously, congrats. Oh my! Beren is adorable. Wishing you and your little family all good things. And of course, sleep and smiles. Thank you so much! Sleep is scant, but smiles are abundant. You are a wonderful writer! And you’ll be a wonderful parent! Blessings on the three of you! Thank you, Sheila — we’re feeling incredibly blessed already! Aw, thanks Jacqueline. And everything is going great with Jack. He is sleeping more during the night. My parents have him in their room right noe, but they’re going to move Jack to his nursery soon. Hopefully. And I will ask my mom tonight if and when I can send my books and letter and stuff. And I can’t wait for this weekend. The Mosinee Silverblades Figure Skating Ice Show is this weekend. On Friday, it’s at 7:00-9:00 p.m. and on Saturday at 1:00-3:00 p.m. and at 6:00-8:00 p.m. Anyway, I hope everything with Beren is going good. Ooops, I meant now, not noe. Sorry for the typos. Aw, glad to hear that everything with Beren is going good. I wish I could see you in person again, but for now, I can only hope. Uh-oh. I gotta go to bed. Buenos noches. (That’s Spanish for Good night.) Adios, mi amigo. My great grandma had a heart attack today. It was mild but it still turned my day upside down. I remember last November we went to visit my dad’s adoptive mom in the hospice and she died in the middle of the night. I really hope that dosen’t happen with my great grandma. But I do have one thing to look forward to. Tomorrow is my cousin’s first birthday party. Eden was born with Prader Willi (IDK if I spelled it right) and she will be a year old on Monday. Time flies. Happy mother’s day Jacqueline! I feel so happy right now. I basically broke up with my now ex-bff on Friday. And I wrote a letter to my crush apologizing for some stuff that happened and he said it’s all good. 😀 😀 😀 😀 😀 I AM SOOOOOOOOOOOOOOOOOOOOOO HAPPY!!!!!!!!!!!!!!! ANYWAY, I HOPE YOU HAD A GOOD WEEKEND. I DON’T KNOW WHY I’M ON CAPS LOCK. OH WELL………… BAIIIIIIIIIIIIIIIIIIIIIIIIIIII JACQUELINE!!!! Yaayyyyyyyyyy!!!!!!!!!!!!!!!!!!!!!!!!!!!!!!!!!!!!!!!!!!!!!! !And I understand for the slow replies. I gotta go. Baiiiiiiiiii!!!!!!!!!!!!!!!!!!!! Well, apparently I have strep throat. The advantage is that I’m not going to school tomorrow. The disadvantages are that I’m going to miss the band concert tomorrow night and I have to deal with feeling horrible. Ugh. I hate being sick. I just finished my choir concert a couple hours ago. It was a lot of fun. And I am such a klutz. Today I was in choir but we were practicing in the auditorium. After we were done practicing I went to grab my stuff and I tripped over a cord for one of those floor microphones. Now my knee is a lovely (not!) shade of blue and purple. And I have the track meet thingy tomorrow. YAY. I’m actually excited. I’m doing the 50 meter dash, 100 meter dash, and long jump. But I will probably fail at running. And I didn’t know that a bruise was caused because of a blood vessel that broke under the skin but the skin itself didn’t break. Huh. Anyhoo, I’m really bored right now. 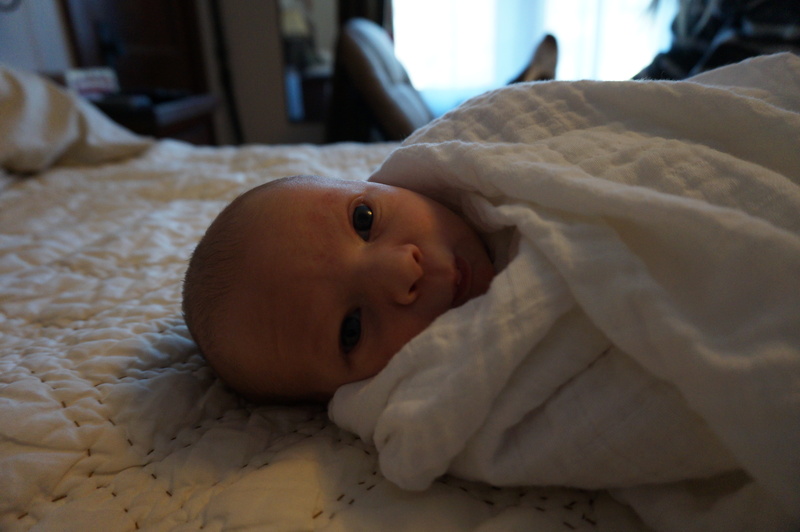 Oh, and jack is starting to roll over! When he’s on tummy time, he leans waayyyyyyyyy over to the side and then he rolls onto his back for the most part. My mom has to kind of push his legs over for him. And he’s smiling a lot. And he has laughed too!!!! It’s so cute!!!!! What is Beren doing right now? I am currently drawing. I think it’s supposed to be Olive, but I’m not really sure… all I’ve drawn so far is the shape of a face, an eye, and eyebrows. Anyhoo, I shall be sending a letter and my books soon. I think. I asked my mom today when I could send them, and shes like, “I dunno.” So yeah. And I am currently reading Still Life. I’m at the part where they pulled Mr. Nivens out of the painting and they see Rutherford’s glove on the ground. So suspensful! Anyhoo… yeah. I get to go back to school tomorrow! Yay! Kinda. Hey, at least I get to see a specific person tomorrow… :$ hehehe. I hope everything with Beren is going good! Bai Jacqueline!!!!!! A lot has happened in the past week. On Monday it was a normal day. On Tuesday, my great-grandma died from heart failure. :'( :'( :'( On Wednesday we went to Mission Lake and now my crush probably thinks I’m crazy. On Thursday, it was our last full day of school. Now it’s Friday morning and it’s our last day of school! I’m almost an eighth grader!!!! I’m excited for summer, but I’m going to miss my teachers. And Jack was laughing last night. It was so cute! I hope Beren is doing good! Bai! So… yeah. It’s a website where you can read and create fanfictions. My username is snicklefritz192, in case you were wondering. I think you would enjoy Wattpad. I can hear Jack laughing right now… It’s so cute! Anyhoo, I just wanted to let you know that I’m going to Madison on a mission trip. I’m going to be gone until Wednesday. So I won’t be able to check your blog. But I will be having fun and helping people and helping them to know that God is there among them. He is everywhere. Here among us, up in Heaven, and everywhere in the world. He is even with people who don’t believe in him. And knowing that I’m helping and doing God’s work through my hands is awesome. So that’s why I might not reply for a while if you reply early this week. And happy early Fourth of July! Hi Nicole! So sorry for another long gap here — Beren is keeping us crazily busy, and I’m between phases of a big book project too (more news about that on the blog soon, I hope!). Thanks for the updates on all the new twists in your life. It sounds like there’s been a lot of both good and bad lately, with some shades of gray between, but I’m glad you’re undertaking these new adventures. I hope the trip to Madison is a marvelous experience – and happy 4th of July to you too! The trip to Madison was a lot of fun! Now I’m home from LaCrosse. We go down to LaCrosse every year for the Fourth. I’m watching my brother in the exersaucer and I keep (accidentally) scaring him with scary noises. Now he’s “talking”. SO ADORABLE. Anyhoo, hope your summer is going good! See ya! I just realized how messed up us humans are. We have done so many bad things in the past two millennia since Christ rose. Even in the past century. Not only one but two World Wars. The concentration camp crap with Hitler. 9-11-01. And so many other things. We have ruined the Earth by overproducing, tearing down things, expanding our cities, and all that was for what? It was because us humans are too selfish to think about anything other than our needs. Humanity will se the greatest ting ever to happen in all time in just a few months. Jesus Christ will come again. I have always felt as though I was someone else. Something else. But each time I really reach inside myself and try to find it, it retracts even further inside. But I think I know what it is. The Holy Spirit. But it’s not just me who has it inside. Everybody does. And Jesus is coming again. I really wish I could go to the Summer Celebration of The Arts thinamajigy… But I doubt I could. Unless a miracle happened. It’s too far for us to travel, especially with a baby. And I asked my mom when I could send my books last night, and she’s like, “I dunno” And I’m like, “AskjghdjhjakjshffkjblwewkJFBAESFBJKAFHBWhjknmfsDBK;K;DFJSZBVHJDSZHLFDSBZLJHJLljzjfdsbsdzjv. UGHHHHHHHHHHHHHHHHHHHHHHHHHHHHHHHHHHHHHHHHHHHHHHHHHHH. JUST TELL ME ALREADY.” So you can expect them in the near future. Bye! Wow. Looking back in the past year, a lot has changed. I lost my last great-grandparent, I lost one of my cats, I got a new baby brother, I lost one of my best friends over something stupid, I gained 3 new friends for the friend I lost, I embarrassed myself in front of my crush multiple times, I laughed, I cried, I got bullied, I questioned some big things, I figure skated, I danced, I had a birthday sleepover that was a disaster (more on that later), I went as a vampire for halloween but ended up not going trick-or-treating because it was too cold, I swooned over my crush, I commented on your blog, I read The Books Of Elsewhere, I wrote a letter to you (which still needs to be sent), but most of all, I have loved, laughed, cried, and LIVED. I have had a lot of ups and downs in the past year, but I have never enjoyed my life more. Hello again Jacqueline! I just want to let you know, in 3 days my parents, brother, best friend and I will all be going down to Wisconsin Dells. I won’t be able to check your blog at all… if I do get some time I’m gonna be surprised. Anyhoo, I have my letter all ready! I’m just working on another little surprise/gift for you. I think you’ll like it. It has to do with the Books of Elsewhere… That’s the only hint I’m gonna give you. Anyway, I hope I will be able to send it this week! So… yeah. I hope your summer is going good! I know mine is! Peace out! OH MY GOSH IM SO HAPPY AND EXCITED RIGHT NOW I CANT BREATHE I CANT BREATHE. I need to calm down. Okay. I am currently in Luck, Wisconsin in a cabin we rented for my moms birthday. We are literally a hop, skip, and jump away from the Minnesota-Wisconsin border. And we were in Minnesota yesterday and I’m like “OH MY GOSH IM IN THE STATE WHERE MY FAVORITE AUTHOR LIVES OH MY GOSH” and Minnesota holds much more significance for me now. I happened to have The Shadows along with me and my moms like “why don’t we drop you off in Red Wing at that authors house that you like so much and you can get your book signed.” And then I said “OMG THAT WOULD BE SO COOL!!!!!!!!!!! But here’s a few problems: 1. I cant just show up and be like “hai I’m Nicole from the blog can you sign my book that would be so cool okay now sign it thanks.” That would be weird. 2. I don’t know her address, obviously. 3. It would probably take forever to get there. But I guess that would still be SO AMAZING IF I COULD GO TO HER HOUSE.” And in case you’re wondering why I’m typing so weird, its because I’ve been up since 5 in the morning and I only got 6 hours of sleep because I have to sleep on this super uncomfortable pull-out couch. And I’m SO HYPER. ERMAHGERD I NEED TO CALM DOWN. Just wondering, what would you do if I (or someone else) randomly showed up at your house asking for you to sign their book(s)? Have you ever had that happen before? Hello again Jacqueline! I talked to my mom and she said I could send my books in the mail on Friday! I NEED FRIDAY TO COME NOW. RIGHT NAOW. Anyhoo, I’ve already written my letter! Oh, and just a forewarning, there is a ginormous explosion of art. So yeah! Peace out!